This blog is created to collect and discuss the information available about the great saints, who incarnated on this earth in order to make the mankind happy and drive the common man towards the ultimate goal of human life. Bhogar was a South Indian by birth, belonging to the caste of goldsmiths, who became a siddhapurusha under the guidance of Kalanginaathar. In Bogar's Saptakanda he reveals details of various medicinal preparations to his disciple Pullippani (so named as he is believed to have wandered in the forests atop a puli or tiger) and at every stage he quotes his guru as the authority. Also Pulippani must have been a young man then, as he is often referred to as a balaka. It is said that as per the last wishes of his guru, Bhogar proceeded to China to spread the knowledge of siddha sciences and strangely enough his journey is said to have been made with the aid of an aircraft; he demonstrated to the Chinese the details of the construction of the aircraft and later built for them a sea-going craft using a steam engine. The details of these and other experiments demonstrated by Bhogar in China are clearly documented in the Saptakanda. 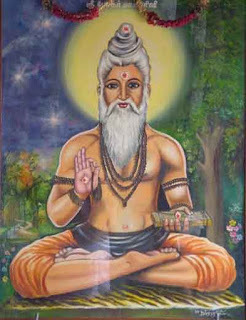 Bogar's guru, Kālāngi Nāthar, is believed to be a Chinese who attained siddhi in South India and thus became included among the Eighteen Siddhars. Is he the inventor of Siddha Vaidya? Copyright Spititual-note.com. Simple theme. Theme images by Airyelf. Powered by Blogger.